Jump on It is the fourth album by the California-based hard rock band Montrose. It is the second Montrose album to feature singer Bob James and keyboardist Jim Alcivar, and features bassist Randy Jo Hobbs on three songs. The remainder of the bass parts were supplied by Jim Alcivar via the keyboard and there was no bassist on the Jump on It tour. Jack Douglas produced the album. Jump on It was the band's third highest-charting release, reaching No. 118 on the Billboard 200 in October 1976. Randy Jo Hobbs – bass on "Let's Go", "Jump On It" and "Rich Man"
^ "Montrose - Jump On It". Superseventies.com. Retrieved April 26, 2011. 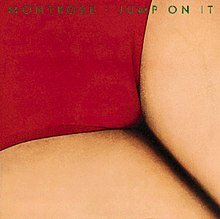 ^ "Jump on It - Montrose - Songs, Reviews, Credits". AllMusic. Retrieved 18 November 2017. ^ "Montrose". Billboard. Retrieved 18 November 2017. This page was last edited on 22 October 2018, at 18:47 (UTC).